Before the death of festivalgoer Louella Fletcher-Michie, the daughter of Holby City actor John Michie, very few people had heard of the 2C collection of drugs. But for Nicole Ryan, it had already devastated her family. "I miss him all the time," Nicole tells the BBC's Victoria Derbyshire programme, remembering her brother Alex. "You never really think you're going to outlive your youngest sibling. But I have. "I only got 18 precious years with him." In 2016, Alex died after taking an illegal drug referred to as the N-Bomb, otherwise known as 2C-I-NBOMe. 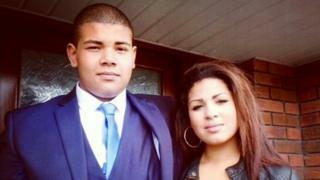 Aged 18, he had been at a house party with friends when he and five others collapsed. Alex believed he had been taking 2C-P, the same drug as Louella - who became what is thought to be the first person in the world to die from it in September 2017. When Alex's cause of death was investigated, however, the toxicology report showed it was the N-Bomb - part of the same 2C group of psychedelic drugs. These drugs can be sold in liquid, powder or tablet form and are consumed for their stimulant and mood-altering properties. "It's just one drug that he took that cost probably less than £20. And it ruined everybody's life," Nicole says. Both the N-Bomb and 2C-P are class A drugs. The N-bomb, which was banned by the UK government in 2013, is particularly psychoactive and causes extreme hallucinations, while 2C-P has gained popularity as a party drug. Tony Saggers, a former drug detective with the National Crime Agency and one of few people in Europe to have looked at the dangers of the 2C family, says the substances "alter the state of consciousness in the user". They also take longer than most drugs to take effect, which puts users at a greater risk of overdose. "It would not be unusual with this type of drug to wait a couple of hours, think nothing is happening and then take another dose before the first one has had a chance to kick in," Mr Saggers explains. Their effects also last longer than MDMA and ecstasy, between 10 and 20 hours. On the night Alex overdosed he suffered a cardiac arrest. "He was found on the floor clutching his chest," Nicole explains. "The paramedics came, they tried to save his life, but his organs started to fail and his brain was the issue. "He had no oxygen to the brain for around 15 minutes, so it kept swelling." This may be a common eventuality. Very little research has been done on the drugs, but at the trial of Mr Broughton - Louella's boyfriend - cardiac expert Prof Charles Deakin cited a US newspaper article suggesting two out of seven people went into cardiac arrest after taking 2C-P at a festival. In the case of Louella, she was reported screaming and attacking herself having taken the drug at the musical festival Bestival. Similarly, in Alex's case, there were also disturbing accounts of how those at the party were hallucinating while covered in blood. "There was people on the streets, there was blood inside the house," Nicole says. "They were manic, they were dancing, they were screaming, they were shouting and it was scary to come across that. "If you can imagine there's just one person lying on the floor inside there, and nobody's even acknowledging this person was dying. "Passers-by happened to walk in and defuse the situation before the paramedics came." Alex's death led the Health Service Executive in Ireland to issue a warning about the dangers of the 2C family of psychedelic drugs. Nicole now spends her time raising awareness of their dangers. She says her brother's death had not been in vain, because it had provided others with a second chance of life. "He donated two of his livers, his kidneys and his heart," she explains, "so giving away his organs made the whole thing easier for us. "His heart, it still beats today, and it never stopped. "And that's really what keeps us going, to even have the notion that one day we might be able to hear it again."